The Great New Year’s Eve/Day Cast On Event! That’s a very long-winded way of saying NEW PROJECT TIME EVERYONE!!! 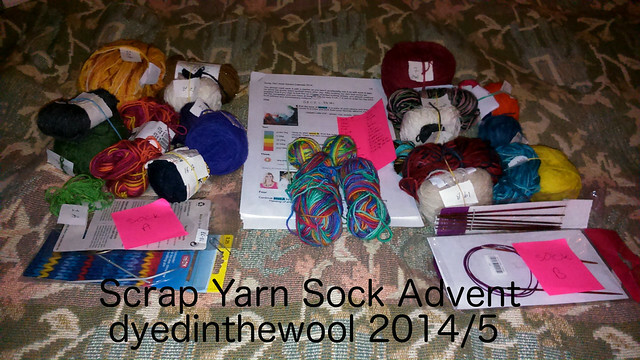 I’ve decided to do a bit of a scrap-yarn-down and the Scrap Yarn Sock Advent Calendar 2014 pattern fits the bill. I’ve already got each of the days planned out (the advantage of not playing along in real time) so I can get all the yarn sorted in advance. Well … that’s the theory, anyway. All the yarn for the Scrap Yarn Sock Advent pattern. Some yarns will be used more than once. The yarns in the centre are for the toes, heels and ribbing (rather than try and match all of the other yarns I decided to try and match none of them!). I could knit sock A first and then sock B, since I’m not playing along in real-time, but I think I’ll stick to the order laid out in the pattern. It turned out a little darker than I’d thought so for clarity, the purple strand is the top on and the green (marled) is the bottom strand.